Update Friday, August 3 at 11:30 a.m: The Ubyssey has been given a more in-depth review of the current AMS investment portfolio, which shows that it invests in major oil and gas companies such as Enbridge Pipelines Inc. and Inter Pipeline Ltd. through the RBC Canadian Money Market Fund. But with the new investment policy, these investments will soon be replaced with fossil-free options. Many of the current indirect investments in fossil fuels, such as the Government of Alberta Bond, will likely remain in the new portfolio. 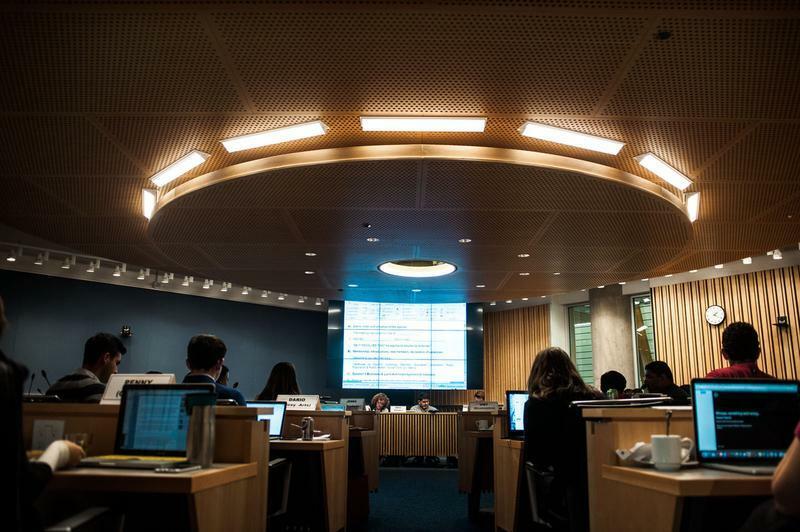 AMS Council has approved a fossil fuel-free mandate for the society’s investment policy yesterday, after hearing interests about this divestment at its June 20 Council meeting. The AMS investment portfolio is managed by BMO and RBC Phillips, Hager & North Investment Funds Ltd. (PH&N), with RBC set to manage the majority of AMS finances in the future. “Those that started the AMS investment policy made sure they avoided those kinds of companies by carefully selecting the fund managers and telling them that we don’t want to invest in fossil fuel companies,” said Akuechbeny. Subsequently in a July 16 interview, Akuechbeny clarified that the AMS is currently “not really fossil fuel free,” explaining that there are a number of direct and indirect investments that hinder the portfolio from being a sustainable investment fund. Beyond the brief slide presentation at the August 1 council meeting, it’s currently difficult to discern the full composition of the AMS’s investment portfolio, as the society is exempt from BC’s Freedom of Information Act. Members could review the current documents in person under AMS By-Law 18, but photos and notes were not permitted. In addition to working with the AMS Sustainability Committee and Sauder S3i over the last few months, Akuechbeny met with RBC PH&N in late July to discuss the financial viability of moving to a fossil-free fund. This decision was given the green-light by PH&N’s investment managers after crunching the numbers. In the long term, fossil free funds are producing larger returns than standard non-fossil free investments, with the top 100 green equities outperforming their oil and gas counterparts. Following the approval from AMS Council, RBC PH&N is set to create a portfolio composed of the RBC Vision Fossil Fuel Free Global Equity Fund and a custom fixed-income investment portfolio. In total, these assets value approximately $16 million. Due to the limiting nature of creating a fossil-free portfolio, the policy has been modified to allow greater investment in foreign markets to ensure that the AMS maintains a diversified portfolio. The investment managers will also be using a global exclusion list based on the Carbon Underground 200 Report, which shows the top 100 coal and 100 oil and gas public companies as ranked by “the potential carbon emissions content of their reported reserves.” Another important component is the ESG criteria, which ranks companies based on their environmental, social and governance practices and profiles. But the AMS also acknowledged that it would be “extremely difficult” for an absolute divestment, as many companies are still indirectly linked to fossil fuels in some way. AMS Associate VP Sustainability Michelle Marcus explained during the Council presentation that this initiative is meant to be a statement that takes away the social license from fossil fuel companies instead. “Students wanted to see this happening, and that’s how we make ourselves better as a society,” Akuechbeny said. Akuechbeny attributed this initiative to the large amount of engagement UBC has seen from students, who have been actively voicing their support for socially and environmentally conscious practices over the last few years. In 2014, UBCC350 — a student group spearheading divestment efforts on campus — held a referendum on the issue. With 76.9 per cent of students and subsequently 61.9 per cent of faculty voting for divestment, the AMS was able to call on UBC to divest from fossil fuels. “I think it’s becoming a common cause among UBC students to encourage any sustainable practice, and I think as the student’s society, the best way to do that is through our investments,” said Akuechbeny, who also emphasized “moral investments” during his election campaign. "Sustainability has been a key value for the AMS for several years ... Climate change is a student issue as young people will bear the impacts of decisions we make today." UBCC350 also later worked with the university to make the fund fossil fuel free. This article has been updated to attribute an explanation about the policy to Associate VP Sustainability Michelle Marcus, to clarify that the portfolio include some direct and indirect investment into fossil fuels prior to the new policy and to correct the total value of the new portfolio. The headline has also been updated to better reflect this clarification.